This fine photo won my personal Pulitzer Prize for photography recently. 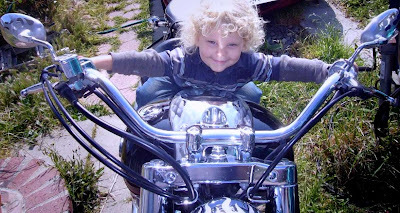 It's my niece's son Willam aboard his grandfather's motorcycle in California. Like most boys, William likes motor vehicles. Posing smiling children on motorcycles is a tradition as old as motorcycles. It usually works out better for everyone than that other tradition of motorcycle photography: asking your girlfriend to pose wearing a smile.